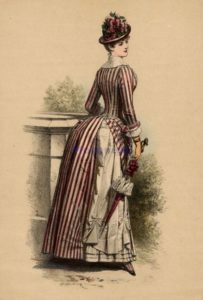 In the Early Bustle and Natural Form Bustle Era of the Victorian Age, the Bustle had dwindled in fashion. However, in the Late Bustle Era 1883-1889, Bustle came back into vogue and fashion with a bang! The skirts of the gowns remained slim in the front and sides but bloomed and blossomed out at the back. This was called a Bustle Framework. By the Natural Form Bustle Era, vertical lines became more fashionable, trendy and preferable. It made the bodies look taller and slimmer. The trend continued in the Late Bustle Era. The lines started from the top as a blend of horizontal and vertical lines. In the coming years of the Victorian Era into the Late Bustle Period, became more vertical. The bodices shortened to above the hips. The sleeves were high on the shoulder, which gave a covered look. The shoulders were generally covered during this period. The flat areas were not left flat. Braids and beadwork were used to fill up the flat areas. The evening bustle gowns were all high on the shoulder. Most of them did not have sleeves. The length of the skirt touched the floor. The back was long and rich in draperies. they were lifted and tied into poufs. All the skirts were generally floor length, the formal wear was a bit shorter. Poufs, swags, and drapes became very popular and became an art form and separate couture themselves. Because drapes grew more complicated, trimmings declined. Trimmings were made of fur and fringes. Many new designs and cuts came into popularity. Asymmetrical designs and lines were popular. The daytime Bustle Dresses were high together with a collar. Even for evening and dinner parties, the necklines were conservative and high. The designs became more sophisticated. A more tailored look became popular. Shaal collars and frills helped to work as jackets. Decency was preferred. The sleeves were full and puffed up at the shoulders but were fitted on the wrist. 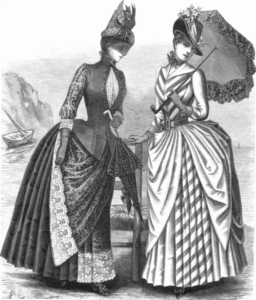 The bustle reached its utmost height and maximum popularity by 1887-1888. It became synonymous to Victorian Fashion and Couture. 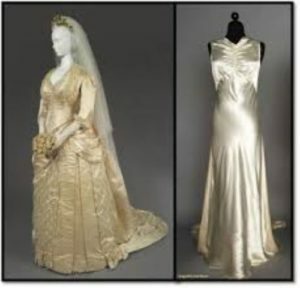 The wedding Dresses had the bustle and came to be known as Bustle Weddings Gowns. 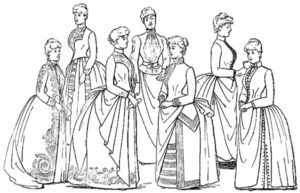 After 1889 Bustle dwindled in popularity and fashion. The puffs and swags gave way to simple, plain looking skirts. Because the skirts became narrow the sleeves became larger and puffy. This gave rise to the designs and fashion of the 1890s with big sleeves. 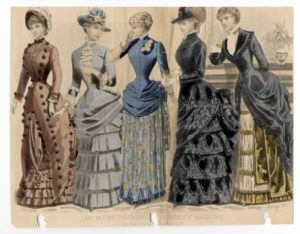 The soft curve Bustle of the early 1870s was replaced with a newly designed silhouette. It featured a severely tailored figure from the front and had draperies at the back. The train had disappeared mostly. A Late Bustle or tournure with a fitted skirt produced a straight look in the front. It was tight and hugging at the hips. And exploded into a back fullness which appeared fuller and with a big Bustle and Puff. Most of the bustle remained at the back. The Bustle was gathered or pleated at the back. 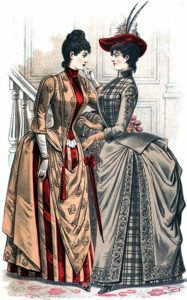 The 1880s Victorian Bustle dresses were styled quite high and stylishly. The hair, which was worn generally high to highlight the back.